Macau (Macao SAR) - March 27, 2019 (travelindex.com) - Led by chef Julien Royer, Odette is the first Singapore restaurant to take the top spot in Asia’s 50 Best Restaurants list. Odette in Singapore has taken top honours at the Asia’s 50 Best Restaurants 2019 awards ceremony, succeeding four-time winner Gaggan in the No.1 spot. Chef Julien Royer’s Odette claims the coveted titles of The Best Restaurant in Asia, sponsored by S.Pellegrino & Acqua Panna, and The Best Restaurant in Singapore. Odette ranks first as well at the Top25Restaurants.com/Singapore guide by Travelindex and the trusted Restaurant Rating Index. Top25Restaurants is the world's first restaurant guide based on AI (articial intelligence and machine learning). Housed in the iconic National Gallery Singapore, Odette serves Asian-inspired modern French cuisine, each dish presented with impeccable style and characteristic perfection. Taking its name from Royer’s maternal grandmother, Odette earned Asia’s Highest New Entry Award in 2017 before debuting on The World’s 50 Best Restaurants list last year at No.28. 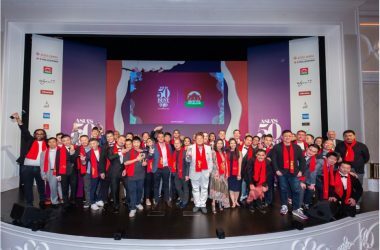 The 2019 list of Asia’s 50 Best Restaurants, sponsored by S.Pellegrino & Acqua Panna, was announced at an awards ceremony at Wynn Palace, Macao. The 2019 list reflects the diversity and vitality of the ever-evolving Asian gastronomic scene, featuring 10 new restaurants, including a first-time entry from Malaysia (Dewakan, No.46) and a new restaurant in the Philippines (Toyo Eatery, No.43), a country last represented in the list in 2017. Host destination Macao counts two restaurants with Jade Dragon rising eight places to No.27 and Wing Lei Palace debuting at No.36. William Drew, Group Editor of Asia’s 50 Best Restaurants, said: “Now in its seventh year, the Asia’s 50 Best Restaurants list continues to evolve, inspire and showcase emerging talent. The 2019 list welcomes 10 new restaurants, including a first-time entry from Malaysia, and celebrates the ongoing culinary innovation in the region." Foodies, Chefs and all fine dining lovers now await the new rankings at Top25Restaurants Guide Asia by Travelindex and the trusted Restaurant Rating Index. Top25Restaurants is the world's first restaurant guide based on AI (artificial intelligence and machine learning). Japan leads the 2019 list with 12 entries. Fronting this group is Den (No.3), earning the title of The Best Restaurant in Japan for a second consecutive year. Den’s charismatic chef, Zaiyu Hasegawa, was also rewarded for his innovative approach and named the 2019 recipient of the Chefs’ Choice Award, sponsored by Estrella Damm, the only award voted for by the chefs of the Asia’s 50 Best Restaurants 2019 list to recognise a peer making a positive impact on the restaurant scene. The top 10 also includes Japan restaurants Floril�ge (No.5), Narisawa (No.8) and Nihonryori RyuGin (No.9). Sazenka and Sugalabo, both in Tokyo, are newcomers to the list, landing at No.23 and No.47 respectively. After holding the No.1 spot for four consecutive years, Gaggan in Bangkok moves to No.2 while retaining the title of The Best Restaurant in Thailand. Entering the list at No.16, Gaa in Bangkok has double reason to celebrate. As well as claiming the Highest New Entry Award, executive chef Garima Arora is named elit™ Vodka Asia’s Best Female Chef 2019. Among the remaining six Thailand entries, S�hring holds at No.4, Bo.Lan rises 18 places to No.19 and Paste climbs three places to No.28 while Sorn, specialising in Southern Thai cuisine, is a new entry at No.48. Singapore claims seven entries on the list, including newcomer Nouri making a bow at No.39 and longtime favourites Burnt Ends and Jaan rising to No.10 and No.32 respectively. The remaining Singapore restaurants are Les Amis (No.33), Waku Ghin (No.40) and Corner House (No.49). Ultraviolet by Paul Pairet (No.6) in Shanghai is named The Best Restaurant in China. Hong Kong counts nine restaurants on the list, including The Chairman (rising from No.22 to No.11) and first-time entries Vea (No.34) and Seventh Son (No.44). Soaring 25 places to No.15, modern French bistro Belon is crowned with this year’s Highest Climber Award. Ascending 11 places to No.7, Mume in Taipei clinches the title of The Best Restaurant in Taiwan, besting two-time winner, Raw (No.30). Locavore (No.42) in Bali earns dual honours. As well as holding the title of The Best Restaurant in Indonesia, Locavore wins the Sustainable Restaurant Award in Asia, presented to the restaurant with the highest environmental and social responsibility rating, as determined by audit partner Food Made Good. Indian Accent, rising two places to No. 17, returns as The Best Restaurant in India for a fifth successive year. Ministry of Crab in Colombo (No.35) is named The Best Restaurant in Sri Lanka for a fourth time while Toyo Eatery, the 2018 recipient of the Miele One To Watch Award, enters the list at No.43, claiming the honour of The Best Restaurant in Philippines. Popular Seoul restaurant Mingles (No.13) retains the title of The Best Restaurant in Korea. Asia’s Best Pastry Chef Award, sponsored by Valrhona: Fabrizio Fiorani from Il Ristorante Luca Fantin, Tokyo. Italian chef Fabrizio Fiorani developed his pastry skills in the kitchens of such acclaimed restaurants as La Pergola in his native Rome and Enoteca Pinchiorri in Florence. Expanding his horizons, he travelled to Dubai and Portugal before settling in Tokyo. His desserts seamlessly complement chef Luca Fantin’s contemporary Italian tasting menu and Fiorani’s first cookbook, Tra L’Onirico e Il Reale (Between Dreams and Reality), was published in 2018. Since 2008, Hong Kong’s 8½ Otto e Mezzo Bombana has been celebrating chef Umberto Bombana’s native cuisine, serving refined Italian food with the finest seasonal ingredients sourced from around the world. After debuting on The World’s 50 Best Restaurants list in 2013 at No.39, the restaurant has ranked within the top 20 of Asia’s 50 Best Restaurants list for seven consecutive years. 8½ Otto e Mezzo Bombana’s outstanding hospitality, led by General Manager Marino Braccu, creates a highly refined but warm atmosphere in which diners can enjoy Chef Bombana’s creations. The list is created from the votes of the Asia’s 50 Best Restaurants Academy, an influential group of over 300 leaders in the restaurant industry across Asia, each selected for their expert opinion of Asia’s restaurant scene. The panel in each region is made up of food writers and critics, chefs, restaurateurs and highly regarded ‘gastronomes’. Members list their choices in order of preference, based on their best restaurant experiences of the previous 18 months. There is no pre-determined check-list of criteria, but there are strict voting rules. For the 2019 edition, Asia’s 50 Best Restaurants is once again working with professional services consultancy Deloitte as its official independent adjudication partner. The adjudication by Deloitte ensures that the integrity and authenticity of the voting process and the resulting list of Asia’s 50 Best Restaurants are protected. Copyright © 2019 Travelindex | China Travel Index - Open, Free, Direct | Connecting Travel People. All rights reserved.